Two recent photos served as the inspiration for today’s card. My friend Alexia is a runner and gets up at the crack of dawn to run and photograph the sunrise. Her photos and a recent sneak peek of a card that Carly Tee Minner made helped me decide to make a sunrise with soft colors and turn a snowy sentiment into a Valentine’s Card. I have often had trouble picking a palette of colors to use for a card, but it was easy this time. Trying to mimic a sunrise’s colors of pinks and oranges, I chose several Distress Oxide inks: dried marigold, picked raspberry, spun sugar and worn lipstick. 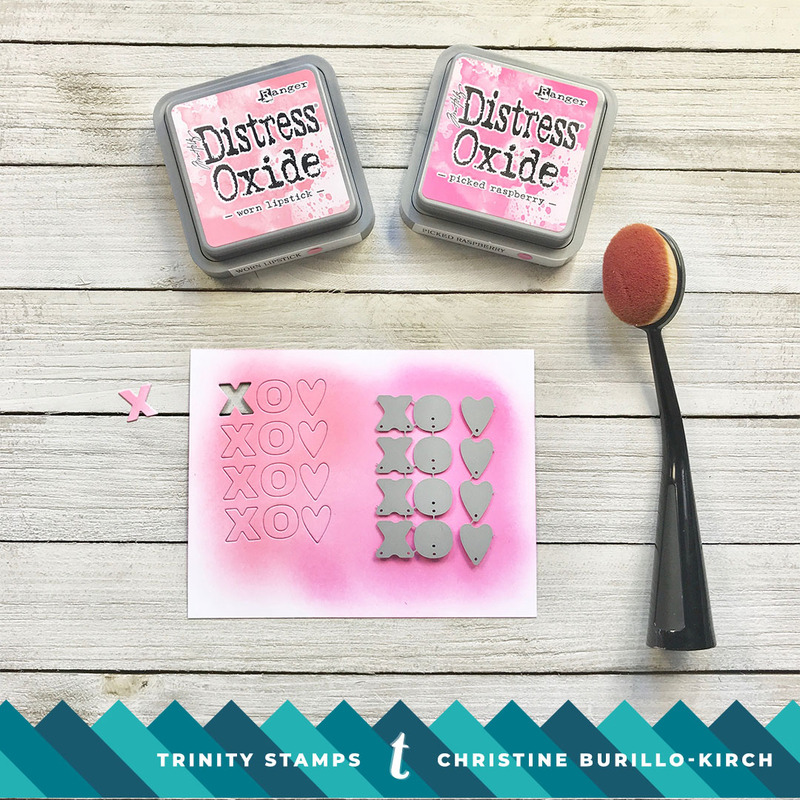 The Trinity Stamps blendability brushes truly make blending easy and fun. I have shied away from making backgrounds such as the one used to make this card because of the difficulty in getting an even transition in coloring. I would never be able to make the perfect background in one try; invariably the color would be too heavy in one area where I wanted lighter coverage and vice versa. It is easy to fix lighter coverage by simply adding more color, but not so for heavy coverage. The blendability brushes give the control back to the user without having to first wipe off a lot of color. 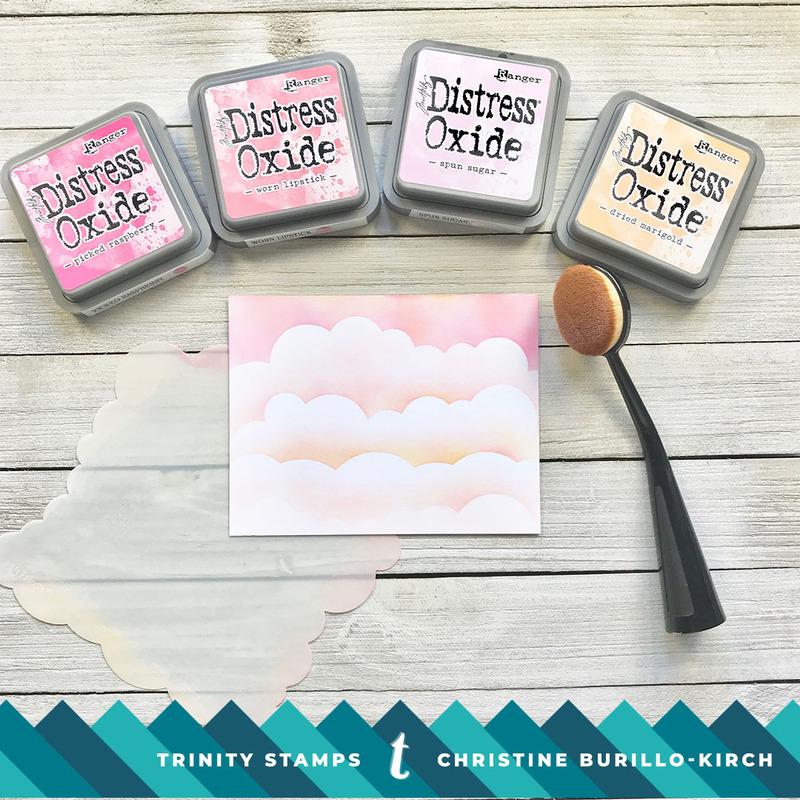 I used a cloud stencil from My Favorite Things (products used are below) to create the dreamy clouds using the distress oxide inks on a 4.25 by 5.5 inch cardstock panel. I used Picked Raspberry & marigold at the top of the card, transitioned to worn lipstick & marigold in the middle and then spun sugar & marigold toward the bottom of the panel. I never wiped the brush in between any of these transitions, which I think helped create a gradient of continuous and gradually lighter color. I decided that to use the Trinity Stamp stamp set “If kisses were snowflakes, I’d send you a blizzard” in puff white embossing powder to tie it into the cloud scene. I love the result. First apply a powder tool to lightly coat the panel and then use versamark ink to stamp the sentiment. Apply the white puff embossing powder and shake off the excess before heat setting with a heat gun. The card needed some final small embellishments, so I used a die from a recent Ellen Hutson release- “Confetti Kisses & Tic Tac Toe”. I wanted the hearts to really pop, so I used the two darkest distress oxides (picked raspberry & worn lipstick) and applied these heavily to cardstock prior to die cutting. The die cut hearts combined with the sweet & tart candy hearts from Trinity Stamps really pull the card together don’t you think? Thank you for stopping by! Have a happy crafty day! What a beautiful card…love all the sweet pink.